Sweet Surrender® grapes are medium to large in size and are elongated and oval in shape, growing in medium-sized bunches. The thin, smooth skin ranges from dark purple to jet-black, and the bright green stems are a stark contrast to the dark color of the grapes. The translucent flesh is juicy, soft, and seedless, but there may be a few small undeveloped seeds that are undetectable when consumed. 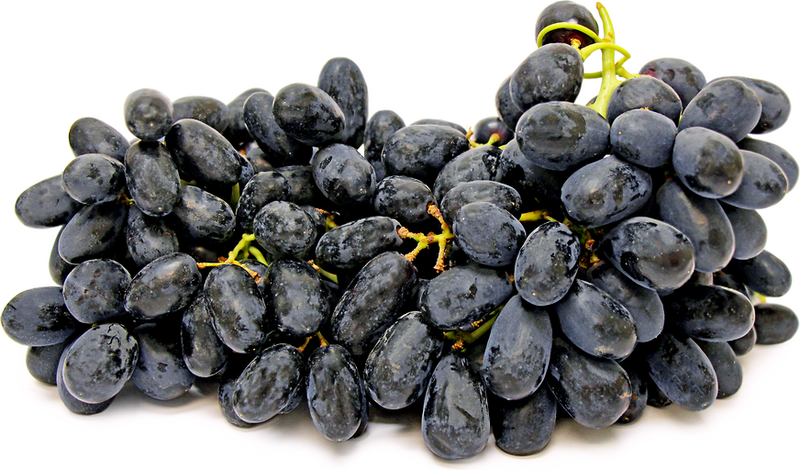 Sweet Surrender® grapes are very sweet and have a rich plum-like flavor with little acidity. Sweet Surrender® grapes are available for a short time in the mid-summer through late summer. Sweet Surrender® grapes are a new hybrid variety of Vitis labrusca and Vitis vinifera developed by The Grapery® of Bakersfield, CA. Known for their sweetness and intense flavor, Sweet Surrender® grapes are an early-season table grape a part of the Flavor Promise® line. While typical table grapes measure at 16 Brix, which is a measurement used for sugar content, Sweet Surrender® grapes have an astonishing 22 Brix as the grapes are left on the vine to fully mature. These “designer fruits” are a successful example of new varieties developed from hand pollination and careful breeding selection without the use of additives to create table grapes with unusual and unique flavors. Sweet Surrender® grapes are an excellent source of vitamins A, C, and K, and flavonoids within the grape’s skin, such as resveratrol, provide antioxidant qualities which can help with overall heart health. Sweet Surrender® grapes are best suited for both raw and cooked applications such as roasting and baking. They can be consumed fresh, out-of-hand, combined with salty cheeses, blended into smoothie bowls, sliced into salsa, or added to fruit salads for a sweet flavor. Sweet Surrender® grapes can also be roasted and reduced into a complex sauce for pork, poultry, or duck, and can be made into jelly or jam. They are also used in baked goods such as pies, shortcakes, and tarts, and can be cooked into flatbreads and sandwiches. Sweet Surrender® grapes pair well with blue cheese, walnuts, rosemary, mint, cucumbers, orzo, chicken, shrimp, and barbequed meats. They will keep up to a week when stored in a plastic bag in the refrigerator. Sweet Surrender® grapes were designed to fill a gap in the commercial grape market. The idea was to bring the flavor and thin-skinned qualities of grapes grown on the East coast of the United States to the West coast grapes that are known for their juiciness and vigorous growth habits. The Grapery® has created several varieties of grapes that fall under the Flavor Promise® category. These varieties have undergone many years of natural cross-breeding to create grapes that have full-bodied, distinct flavors and are meeting market demand for unique table grapes. Other grapes created for the Flavor Promise® family currently include Sweet Celebration®, Sweet Jubilee®, Sheegene 21, and Autumn Royal. Sweet Surrender® grapes are grown exclusively for commercial distribution by The Grapery® in Bakersfield, California. They were developed in 2009 in a partnership with International Fruit Genetics, a California breeding program, as a part of their Flavor Promise® line. Today Sweet Surrender® grapes are available at specialty grocers across the United States and in the United Kingdom. Someone shared Sweet Surrender® Grapes using the Specialty Produce app for iPhone and Android. Sharer's comments : Sweet Surrender® Grapes spotted at Costco 1023.